Edition Details: 1st NZ Edn. Softcover. 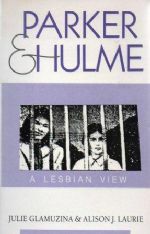 In 1954, in Christchurch, New Zealand, Juliet Hulme and Pauline Parker, aged 15 and 16, killed Pauline Parker's mother. This event resulted in a sensational court case, extensive local and international media coverage, and a public association of lesbianism with 'evil', 'insanity', and 'murder. The authors' discussion of the circumstances and significance of the case goes beyond questions of 'mad or bad?' to look at the social context of mid-950s New Zealand and the surrounding issues of sexuality and social control. Illus., Conclusion, Notes, Bibliog. and Index. 214pp trade size p/back. From the library of true crime writer, Wilfred Gregg, with his personal b/plate. Nr. F. with no creasing to covers.